Callaway staff professional Phil Mickelson will put a new Callaway prototype fairway wood called the X Hot Phrankenwood in his bag at The Masters. 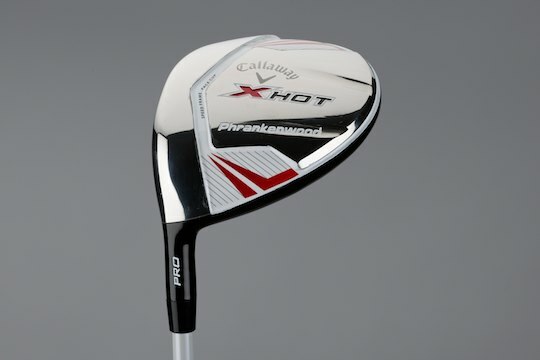 The X Hot Phrankenwood is a prototype club and a bold extension of the X Hot fairway wood technology. Like other X Hot fairway woods, Phrankenwood has a stainless steel construction with a Speed Frame Face Cup, made of high strength Carpenter 455 stainless steel, and an ultra-thin cast stainless steel body. Phil Mickelson’s X Hot Phrankenwood prototype has a 8.5 degrees loft and is 250cc. He is using a 45-inch Fubuki k 70X Prototype shaft in the club. The X Hot Phrankenwood is the brainchild of Mickelson, who wanted a modern 2-wood and collaborated closely with Callaway R&D to bring the product to life in time for the first major championship of the season. Having experienced significant gains in distance using Callaway’s new X Hot fairway wood technology, Mickelson began looking for a fairway wood built from this technology that he could hit off the tee as far as his driver, but with a flatter ball flight and with greater control of the left-to-right shot shape. With a unique combination of shape, size, X Hot ball speed and a significantly lower spin rate he can do this effectively with the X Hot Phrankenwood prototype.